The 2017 season aimed to shake up the established order of things with some new aerodynamic-focused regulations. 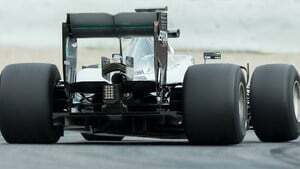 Wider cars and fatter Pirelli tyres were introduced to create more downforce and thus faster cars, and teams were looking to capitalise on the changes to close the gap to Mercedes. The season started with a close battle between Ferrari and Mercedes, but gradually the Silver Arrows dominance began to show once more. Sebastian Vettel put up a solid fight throughout the 2017 season to try and challenge Lewis Hamilton for the world title, but the momentum slowly turned towards Mercedes and allowed the team and the British driver to earn their fourth championships. Ferrari had to settle for second best, with Red Bull clutching at their coat tails. There were some great battles throughout the year, and some drivers managed to shine more than others. Max Verstappen continued to put on good shows wherever he went, but Esteban Ocon was also strong and Valtteri Bottas tried his best to keep tabs on his champion teammate. Fernando Alonso, meanwhile, turned his attention elsewhere, participating in the Indy 500 whilst waiting for McLaren to announce they were ditching Honda. This was the first year under Liberty Media's control, and there were a few tweaks to the podium process and a noticeable increase in online content, but not all that much appears to have changed in the first twelve months. There's still plenty for the sport to do to improve the quality of the show, and the forward-looking attitude of the participants. Enjoy the Sidepodcast F1 season guide. Championship results, calendar and race coverage for the Formula 1 World Championship.